When I was ten years old and my parents weren’t paying me to mow the lawn yet, my grandmother wrote me a birthday check for fifty dollars instead of five dollars. The most remarkable part is maybe that she wrote “fifty” on the check: “F-I-F-T-Y.” My mom wanted me to give it back. My dad persuaded my mom to let me keep the money. I used that fifty dollars to buy Super Mario Bros. 3. Well, June 7th was my thirty-fifth birthday. It’s been ten years since I finished my perfect game of Super Mario Bros. 3, and I still haven’t ever worked on a game like it. 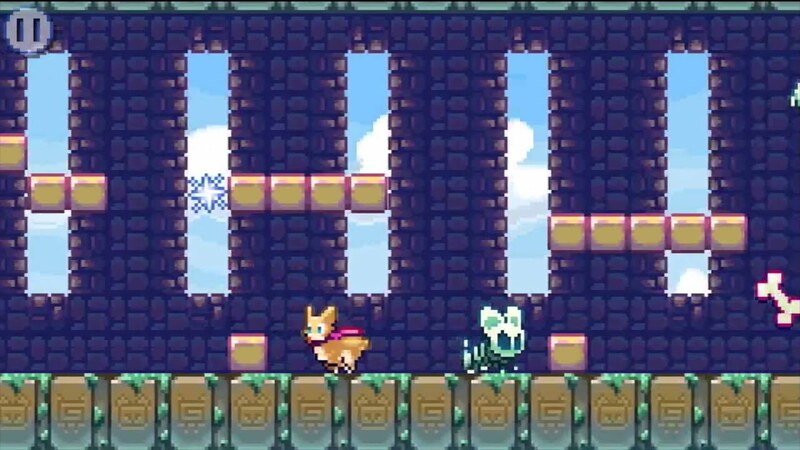 So myself (game design / level design), Michael Kerwin (programmer), Brent Porter (artist), and Ken “Coda” Snyder (music) made Tuffy the Corgi and the Tower of Bones. It’s a platform action adventure game. It’s about a Pembroke Welsh Corgi named Tuffy. Tuffy is on an adventure. Tuffy is excited to be on this adventure. Oh yeah, and Tuffy runs automatically. Touch the left side of the screen (or any of the buttons on the left side of your PlayStation Vita) to turn around. Touch the right side of the screen (or any of the buttons on the right side of your PlayStation Vita) to jump. Turn and jump; jump while turning; turn while jumping. Climb the Tower of Bones. What’s at the top? I am not going to tell you because that would be a spoiler. Collect bones on your way to the top of the tower. See if you can find all 108 bones! What happens if you get to the top of the tower with all 108 bones? That’s a mega-spoiler. 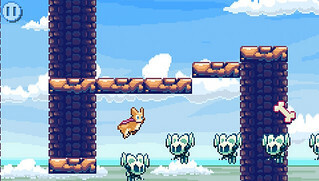 Tuffy the Corgi and the Tower of Bones is an action platform game: you run and jump. It’s also an adventure game: you think and explore to find as many of the bones as you can. It’s also a huge challenge: touch a single spike or enemy and you die. If you die, it’s game over. If you restart, you have to start the whole game from the beginning. Every time you die, we tell you how many times you’ve died since you started playing the game — you’d probably lose count if you tried counting yourself, so let us do it for you! The game is just one level. Trust me, it’s a long level, with plenty of weird little surprises all over it. We made this game for (in addition to ourselves) people who like the challenge of attempting speed-runs of games. We’ve designed the level carefully to appeal to players who want to speed-run getting to the top with all the bones, and also to players wanting to get to the top without all the bones. Maybe (Maybe!) we’ve also included a way to get to the top without collecting any bones at all. I wonder if that’s possible! I wonder if there’s a secret ending if you do that? I’m proud of how weird and long the level design is. I’m proud of how good the jump feels. 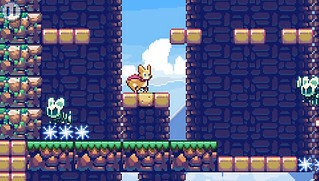 I’m glad that someone finally made a cute side-scrolling platform game with a Welsh Corgi as the main character, and I’m extra glad that it was us at Action Button Entertainment who made it. It was such fun to make this game. We really want to make more games starring Tuffy the Corgi. Maybe we’ll do that someday! For now, please enjoy Tuffy the Corgi and the Tower of Bones — and Tweet at me if you can reach the top with all 108 bones. I’m very, very interested in seeing how many hours of play it takes you to master the game! PS Vita owners can download Tuffy from the PlayStation Mobile section of PlayStation Store for $5.44; Owners of PlayStation-certified devices such as the Sony Xperia Z smartphone, Wikipad or Sony Xperia Z tablet, can get Tuffy through the PlayStation Mobile Store for the same price. Click here for a full list of the certified devices or here for installation instructions. About time a corgi got a starring role in a video game! My corgi is pleased that his people now have representation in the video game industry. This game looks fun! Can’t wait to try it out. Nice story, I remember playing Super Mario Bros. 3 when i was around 3 years old. If you are aware, SMB 3 is NOW $5 on both Wii U and 3DS eShop. I would love it if a pug was playable (Yes, I have a pug). I want PlayStation Mobile in Brazil! Tell Sony to add trophy support to PSM. Even Apple has GameCenter achievements. This game looks great. Any plans for releases on other platforms or is this Vita exclusive? Just an FYI to developers: If the game does well, I’m going to guess that you could make even more money by releasing “skins” for Tuffy that makes her look like a pug or a beagle or a jack russel or… Kudos if it also means you can edit the home page to work with the skin, and even better if the user could input their own name instead of Tuffy. I’m not saying that any choice you made is wrong (I love the name and the Corgi is definitely the right fit for this). However, people LOVE their dogs and get very breed loyal. Just saying. Charming game, it FEELS great which is nice for this type of game. Hilariously, my very first run was my best (11 bones). @8: It might be 5 bucks for 1 level, but from what it looks like, that equates to an easy 20 levels in any other game. There was a lot of variance in the posted video, so it seems like they intended each bit to be a separate level, but decided to roll them all into one just to be different than other games that do similar platforming. Oh a Corgi based game, looks good but at $5.44 I don’t think I can make a purchase for one level, even if it’s a really long one. If I get this will I be able to download it to both my vita and my tablet? This game looks like fun. Great; now I really want to play Sonic the Hedgehog 2 thanks to the music in this game. Looks like a fun platformer. Corgis are gods, so the fact that Tuffy can take damage is unrealistic. There’s a typo, it’s not $5.44, it’s $5.99. After watching the trailer I almost bought it for what I thought was 5.44, which was really pushing it, but 6 bucks. Just too much. Awesome story. But… who writes a check for five bucks? Sony, please, allow us to purchase PS Mobile titles from the web store. It’s killing me, to not have a device that can use them but not be able to prepare for such a time. Great game, I’m enjoying it despite the “arcade” difficulty and permadeath. There was seemingly an avalanche of great games on PSM over the last week or two. I just wish they hadn’t remove the leader boards from PSM 2.0. I don’t know if it caused more certification issues, or what, but I miss it now as both a player and a developer.